Bachelor in Paradise is a 1961 American Metrocolor romantic comedy film starring Bob Hope and Lana Turner. Directed by Jack Arnold, it was written by Valentine Davies and Hal Kanter, based on a story by Vera Caspary. It co-stars Paula Prentiss, Jim Hutton and Janis Paige. The film won three Laurel awards for Best Comedy, Best Comedy Actor (Hope) and song ("Bachelor in Paradise", music: Henry Mancini and lyrics: Mack David), which was also nominated for Academy Award for Best Original Song. Bob Hope was also nominated for the Golden Globe Award for Best Actor – Motion Picture Musical or Comedy. 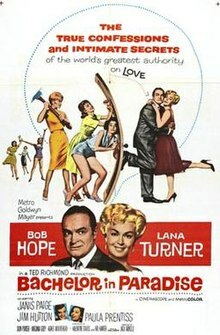 Strangely for a very American film, Bachelor in Paradise had its World Premiere at the Coliseum Theatre in London's West End on November 2, 1961 with a personal appearance from Bob Hope. A.J. Niles is a provocative best-selling author who discovers that he has a large tax debt owed to the IRS, due to being ripped off by his accountant, Herman Wapinger. He goes undercover under the alias "Jack Adams" in a California suburban community called, "Paradise Village", to research a new book about the wives and lives there. Niles is pursued by a flirtatious married woman named, "Dolores", while falling in love with a woman, Rosemary, who rents her house to him. Wapinger is found, Niles' cash is returned to him, and he reveals his true identity on national television. The husbands in Paradise Village all file for divorce, believing their wives are all having affairs with Niles. In divorce court, Niles reveals that he is in love with Rosemary and asks her to marry him. Everyone lives happily ever after. The script was based on an original story for the movies by Vera Caspary - a 70-page document. The film was Bob Hope's first with MGM. He was persuaded to star in it by head of production Sol Siegel. The film marked Lana Turner's first romantic comedy in a number of years. George Marshall was originally signed to direct. Paula Prentiss and Jim Hutton were signed off the back of their success together in Where the Boys Are. MGM put them in three films: this, The Horizontal Lieutenant and The Honeymoon Machine and pushed them as a new William Powell and Myrna Loy. Filming took place in May 1961. MGM was impressed by the film and signed Jack Arnold to direct for them for five years. Before the film was released they requested Hal Kanter to start writing a sequel, An Armful of Girls with Hope as a married man chased over Europe by titled ladies. This was never made. The Los Angeles Times called the film "frequently diverting". According to MGM records, the film earned $2.5 million in the US and Canada and $1 million elsewhere but ultimately lost $344,000. The title song for the film was nominated for an Oscar. It was performed by Ann-Margret at the Oscar's ceremony, and reception to this greatly boosted her career. ^ a b "Bachelor in Paradise". Turner Classic Movies. Atlanta: Turner Broadcasting System (Time Warner). Retrieved August 20, 2016. ^ Fear of Originals Scored by Writer: Art Lost, Says Vera Caspary; 'Under the Skin' Sold to 20th Scheuer, Philip K. Los Angeles Times (1923-Current File) [Los Angeles, Calif] 14 Apr 1961: 27. ^ Looking at Hollywood: M-G-M Signs Bob Hope to Play Bachelor Author Hopper, Hedda. Chicago Daily Tribune (1923-1963) [Chicago, Ill] 09 Dec 1959: b6. ^ Turner, Hayworth New Lead-Getters: Lana to Hope, Rita to Ford; Sinatra in Bid to Moss Hart Scheuer, Philip K. Los Angeles Times (1923-Current File) [Los Angeles, Calif] 06 Apr 1961: A13. ^ Looking at Hollywood: Aldrich Will Produce 'Now We Know' Hopper, Hedda. Chicago Daily Tribune (1923-1963) [Chicago, Ill] 17 Feb 1960: a1. ^ Jim and Paula: Shades of Powell, Loy? Alpert, Don. Los Angeles Times (1923-Current File) [Los Angeles, Calif] 16 July 1961: N4. ^ South Seas Braced for Film Invasion: One-at-a-Time Decree Made Law as Tahiti Goes Hollywood Scheuer, Philip K. Los Angeles Times (1923-Current File) [Los Angeles, Calif] 04 Sep 1961: C7. ^ Judy Garland and Lancaster Costar: Joan Crawford Being Paged; Hope to Do 'Bachelor' Sequel Hopper, Hedda. Los Angeles Times (1923-Current File) [Los Angeles, Calif] 05 Oct 1961: B12. ^ Film Comedy Puts Hope in 'Paradise' Scott, John L. Los Angeles Times (1923-Current File) [Los Angeles, Calif] 26 Dec 1961: C8. ^ Looking at Hollywood: Bob Hope Tells Views on Oscar Awards Show Hopper, Hedda. Chicago Daily Tribune (1923-1963) [Chicago, Ill] 12 Apr 1962: c6. ^ Sunday Night: First TV Special for Ann-Margret MacMinn, Aleene. Los Angeles Times (1923-Current File) [Los Angeles, Calif] 29 Nov 1968: g36. This page was last edited on 20 September 2018, at 17:53 (UTC).